I first took the Gilbert Trail tour last October, and I like it so much I was on another tour last spring, which was in celebration of New York City's Landmarks Preservation Law’s 50th anniversary. 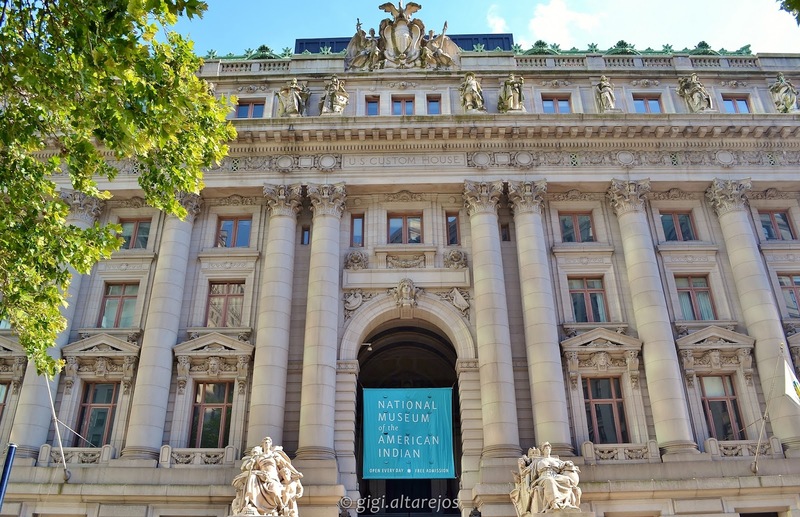 The tour included exclusive tours of three iconic buildings in lower Manhattan designed by the renowned architect Cass Gilbert. The first building on the tour was the Alexander Hamilton U.S. Custom House in Bowling Green. The Alexander Hamilton U.S. Custom House is a building in New York City built 1902–07 by the federal government to house the duty collection operations for the port of New York. It is located near the southern tip of Manhattan, roughly on the same spot as Fort Amsterdam, the original center of the settlement of New Amsterdam. Its address is 1 Bowling Green. The building is now the home of the George Gustav Heye Center of the National Museum of the American Indian, as well as the United States Bankruptcy Court for the Southern District of New York, and since 2012, it is also the home to the National Archives at New York City. This is the facade of the Alexander Hamilton U.S. Custom House I took last summer. Our tour concentrated on the rooms and features inside the building. The interior of the Alexander Hamilton U.S. Custom House is an exquisite example of Beaux Arts planning combining clarity, symmetry, and ceremonial spaces. The building presents a square plan with a central rotunda and surrounding corridors. The ceremonial, two-story Great Hall on the piano nobile is ornately detailed with marble finishes in a variety of textures and colors quarried in the United States, Switzerland, and Italy. At both ends of the Great Hall are curved staircases finished with decorative plaster, bronze railings, and marble treads and risers. This magnificent rotunda greets the visitor upon entering the US Custom House. Clerks used to tabulate the customs duty in the Port of New York from this elliptical area, and the receipts were the primary source of revenue to operate the federal government before the income tax law was established in 1916. 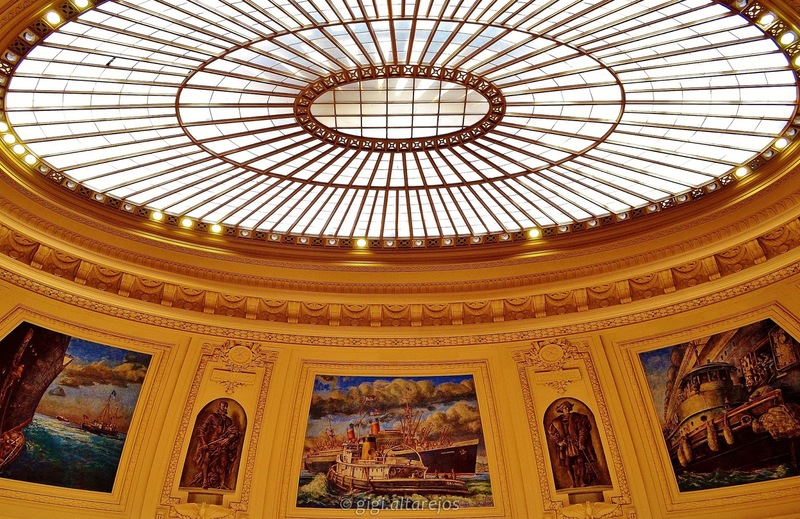 Here's a closer look at one of the paintings in the rotunda ceiling. In 1936 during the Great Depression, the Work Progress Administration and the Treasury Relief Art Project commissioned Reginald Marsh to design and paint eight large murals depicting ocean liners at various stages of arriving in the Port of New York. There was some controversy about what liners should be depicted, and in the end, they were United States Lines‘ S.S. Manhattan and S.S. Washington, then the largest passenger liners under the America flag; Cunard‘s flagship R.M.S. Queen Mary; and the French Line‘s flagship S.S. Normandie. In between the murals are eight smaller panels of depicting explorers. Marsh and his assistants, working fourteen-hour days, completed the murals on December 27, 1937. The project cost the federal government $1,560. The immense arch of the custom house's magnificent elliptical rotunda was built according to the principles of Spanish-immigrant engineer Rafael Guastavino. The ingenious design allowed the rotunda's 140-ton skylight to be constructed without visible signs of support. The nautical theme extended throughout the building. This fish detail was on the door of the Cashier's Office. The main part of the tour was the access to the off-limits Collectors Suite. Shells, marine creatures, and sea signs abound throughout the interior, as befits a tribute to New York's preeminence as a seaport. 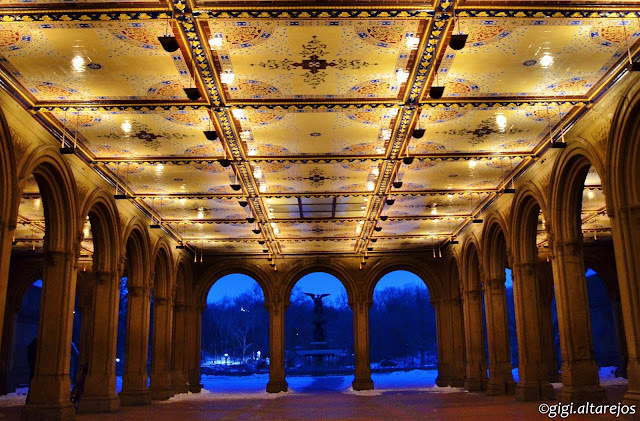 Monumental arches and columns highlight the symmetry of the great hall. Off this spectacular lobby is the ornate Collectors Reception Room, its walls oak-paneled by the Tiffany Studios. Those oak-panel walls are one of the first things you see once you get inside the room. And you can't help but look in awe when you look up at the ceiling. Inside the Collectors Suite is a fireplace with a beautiful mantel, and several large paintings of ships. Fully paneled in oak from floor to ceiling by Tiffany Studios, the office is divided by an elaborately carved Renaissance-inspired screen which is pierced by a doorway marked by a segmentally-arched hood. Above the oak walls were placed ten paintings of 17th-century ports selected because of their relation to the settlement and commerce of the Dutch and English colonies. The paintings and probably all the painted decorations in the vaulting of the Lobby were by the muralist Elmer E. Garnsey. The ceiling of the hallway leading to the rotunda and offices are also painted. It's great to view them from the second floor area, it gives you a different point-of-view. At each end of this long hallway are curved staircases finished with decorative plaster, bronze railings, and marble treads and risers. The tour didn't touch on the building's exterior, where the most significant decorative features are Daniel Chester French's monumental sculptures representing international commerce. Four female figures of limestone sit on large entrance pedestals and represent America, Asia, Europe, and Africa. Above the columns on the main facade are twelve marble statues, representing seafaring nations. Above the windows are sculpted heads depicting the "eight races" of mankind. My photos of those sculptures from a previous visit to the Custom House are in this album. The second building in the Gilbert Trail Tour is the Woolworth Building. The Woolworth Building was designed in the neo-Gothic style by the architect Cass Gilbert, whom Frank Woolworth commissioned in 1910 to design a 20-story office building as the F. W. Woolworth Company's new corporate headquarters. At its opening, the Woolworth Building was 60 stories tall and had over 5,000 windows. The construction cost was US$13.5 million. At both sides near the entrance of the Woolworth are stairs with some figures above the doorway. At each staircase leading up to the mezzanines, a figure crouches in the upper corner. They also appear elsewhere throughout the lobby. The likenesses feature the faces of key people involved in the construction of the skyscraper, their portraits very realistic while their bodies are grotesques. Each holds something that symbolizes their role: Gilbert holding a model of the building; Woolworth with coins; builder Louis Horowitz on the phone to symbolize his use of communication technology in making sure the construction of the building ran smoothly. We then proceeded to the lobby. Once home to an arcade of shops and the Irving National Exchange Bank, the lobby stands two stories high. The north and south wings include open mezzanines. Byzantine-inspired glass floral mosaics of blue, green, gold and red decorate the barrel-vaulted ceilings. Carved marble quarried from the Greek Island of Skyros shapes the walls. Gothic patterns traced in bronze embellish doorways. Because of its grandeur, both inside and out, the Woolworth Building came to be known as the "Cathedral of Commerce." We passed by some beautiful elevator doors. Tiffany Studios designed steel decorative doors with arabesque patterns for some of the 24 elevators in the lobby, which were designed to accommodate up to seven people at a time. State-of-the-art high-speed elevator service shuttled passengers to their destinations. Elevators also once took passengers to the observation gallery on the fifty-fourth floor. And reached the grand staircase at the west end of the lobby. This is the view from the top of the stairs looking out to the lobby. And looking up from those stairs, we have this view of the ceiling, I think it's decorated glass. The edges of the ceiling also has figures of people spaced at intervals. Here's a closer look at one of them. We then went to a small open space at the back of the stairs which also has a pretty ceiling. Then we went down another set of stairs. In the basement are more elevators. These set of elevators was diagonally across a covered up portion of the basement which previously lead to the City Hall stop of the New York City subway. We were also able to access the vault but the way in was narrow and tight and I wasn't able to get a decent picture. The third and last building during the Gilbert Trail Tour was the Thurgood Marshall United States Courthouse. Unfortunately, photos weren't allowed during our stay there. We were granted access to the library and two of the courtrooms. The lobbies and courtrooms were beautiful. I especially love the flower chandeliers that adorn the lobby but since I have no photos of it, I suggest you get on the next Gilbert Trail Tour to see it for yourself, or check on this slideshow and you'll see what I mean. After the tour, I took this shot of the courthouse at blue hour. Thanks to the Cass Gilbert Society for facilitating the tours, I'm glad I got the chance to tour these wonderful buildings. This is a continuation of my previous blog where my friend Angel and I walked through fifteen of the thirty bridges and arches in Central Park. This article will be about the next fifteen bridges and arches. I will continue to link them with their specific pages from Bridges of Central Park as the book contains detailed descriptions. The last bridge we covered in Part 1 of this blog was the Ramble Bridge, and while we were in the area, we saw one of the rustic bridges which has a view of the Lake. A lot of people were crowding on the bridge and when I tried to see why, this was what I saw. A black-crowned night heron stalking prey! We didn't try to find the other rustic bridge as it was deep inside the Ramble near the Azalea Pond. What we did was skirt the Ramble's edge along the Lake until we came to the most famous bridge in the park, the graceful Bow Bridge. Bow Bridge, so familiar to all friends of the park, stands today as the most revered of all the Central Park bridges. The grace and style of the balustrade and the story of cannon balls set in its base somehow set Bow Bridge apart. Like the others, it is in scale and harmony with the surroundings, connecting the Ramble and Cherry Hill with a graceful arch over 60 feet of the Lake. Original plans for the abutments' interior note the presence of cannon balls as movable bearings at the Ramble end of the span, to allow the cast iron to expand and contract. Unitized girders span 87 feet, with an expansion differential of 2 to 3 inches from the hottest summer day to the depths of winter's cold. The bridge is 15 feet 8 inches wide and its arch rises 9 feet 6 inches above the level of the Lake. Some 19 drawings survive in the Municipal Archives. The span was constructed in 1859-60, with ironwork provided by Janes, Kirtland & Co. While work was underway, the company won the contract for the dome of The Capitol in Washington, D.C. Bow Bridge was rushed to completion, with minor changes made to save time. In 1862, the railing was in place. The above photo was taken a month before, on a beautiful spring day. A week after I took that photo, the bridge was closed for restoration work. On the day of our walk, the southern end of the bridge was covered with tarp which the gondolier deftly avoided as he proceeded to steer his passengers along the lake. 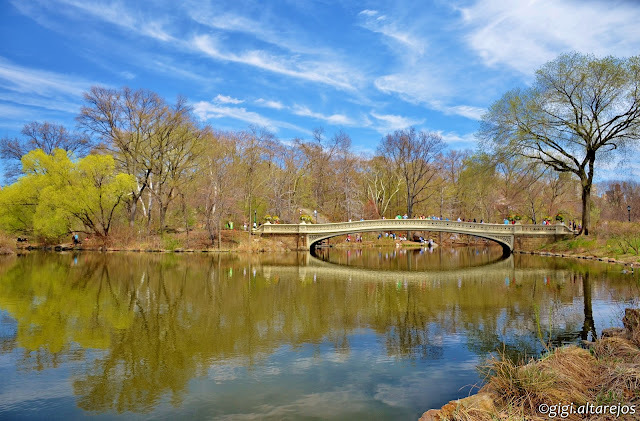 There is a small piece of land which juts out in the Ramble that has a great view of both the Bow Bridge and the Terrace Bridge across the Lake. From an upper terrace, grand stairways on either side descend to an esplanade or "water terrace" below. At its center is the famous Bethesda Fountain. Above the fountain's several basins and iridescent cascade, above its clustered cherubs, stands the Angel of the Waters. Taken together the Bethesda is the city's greatest fountain.The bridge, so far as it serves to carry the carriage road and walk over the entrance from the Mall to the Lake, has a height of 16 feet, a span of 29 feet, and a breadth of roadway of 45 feet. The roadway is supported on wrought iron girders 24 inches in depth, ranged 6 feet 11 1/4 inches apart, and connected with brick arches. The girders rest upon a portion of the main sidewalls of the Terrace structure. A closer view of the arches. And I have to mention its famous ceiling. It is the only place in the world where Minton tiles are used for a ceiling. The large ceiling was the chief visual element. It was covered with brilliant encaustic tiles made by the Minton Company of Stoke-on-Trent, England. Jacob Wrey Mould who worked with Vaux on the decoration was obviously inspired by Moorish work.Minton tile was once also considered for the floor here, much as it is found today on many floors in the United States Capitol. What is here today are panels of red tile bordered with strips of bluish granite, the whole installed in 1910. Here's a photo taken at blue hour last winter. See how pretty the ceiling is! After walking through the Ramble, we realized we had to go back south so we can cross off Trefoil Arch and Willowdell Arch from the list. But first things first! We had a lunch break at the Conservatory Water with this view. I could stay here all day and watch the kids try to steer the model boats. Ahh, the simple joys of childhood! We then proceeded south to the Trefoil Arch, the only arch whose ends have distinctively different shapes. The eastern side of Trefoil Arch has one of the most distinctive facades of all park archways. A round trefoil, which explains the name, frames the archway entrance in the Gothic style with not one, but two focal points equidistant from the center, a trefoil being an ornament in a three-lobe pattern. Most surprising of all is that the revetment is brownstone throughout. 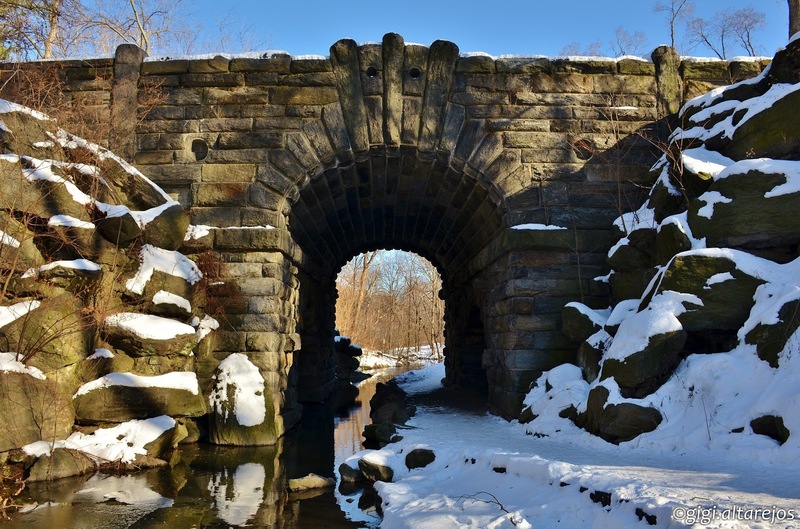 In a generation when brownstone, from the banks of the Passaic and Connecticut Rivers, spread throughout the city and beyond, it was not the favored stone for the park bridges. The tunnel inside is lined with common brick under wood sheathing. Cast iron was used for the east railing. Trefoil was completed in 1862 on the designs of Calvert Vaux and Jacob Wrey Mould.Trefoil is under the East Drive on the path leading from Conservatory Pond to the Lake and Boathouse, in line with 73rd and 74th Streets. Its span is 15 feet 10 inches between abutments, with the highest point 11 feet 9 inches above the path. The underpass is 66 feet and the railing 110 feet long. The view from the rounded end of the arch. Isn't that pretty? Then we set off to find Balto. The dog's statue is near the Willowdell Arch. Willowdell is a sandstone-and-brick segmental arch located at the East Drive on the latitude of 67th Street between Fifth Avenue and the Mall. Its red-brick facing and sandstone trim give it a resemblance to Driprock, its counterpart at the Center Drive. Willowdell's archway is only 49 feet long, measuring 14 feet 10 inches across and 9 feet 10 inches high. Weathering inside the archway from wind-whipped rain has eroded mortar and created some efflorescence. Outside the eastern portal is a statue dedicated to the dog Balto. It was given to the city to commemorate the efforts of Alaskan sled dogs who transported diphtheria serum across Alaska. The archway has bench seating in the wall arcades. A center niche on the north side once contained a fountain, now broken. The idea was to give mothers a place to rest and relax with their children in tow, though it seems doubtful that the echoes under an archway could give any mother relief from boisterous youngsters for too long. I've seen that broken fountain in previous walks, it's on the left side of this photo, the second arch from the left on this photo. Then we headed back north again to look for our twentieth bridge for the day, Glade Arch. Glade Arch, near Fifth Avenue and 79th Street, is among the first of Calvert Vaux's designs. Like Denesmouth, further south, the low elliptical span was constructed with a light-colored New Brunswick sandstone. It measures 29 feet 6 inches across and is 10 feet high. The underpassage is 50 feet 7 inches, and the balustrade extends for 95 feet. I love this arch, it's kind of hidden but that opening above leads the walker to Cedar Hill, a very good spot for a picnic during the summer, and a great sledding area in the winter. Glade Arch's interior vault is made of red Philadelphia brick. From Glade Arch, we followed the path past Cedar Hill and crossed the 79th Street Transverse and made our way towards Greywacke Arch. Gray sandstone and North River greywacke from the Hudson Valley alternate with brownstone from the banks of the Passaic in New Jersey. The surface of the greywacke is tooled, that of the brownstone bush hammered. The earthy gray and brown colors form a contrasting, decorative pattern that accents the horseshoe contours of the arch and the brownstone-incised molding above. The pointed ornamental sculpture is featured on both elevations. The iron railing is in an abstract pattern. The underpass vault is in red brick with white brick inserts. Abutments are fully covered. The span is 11 feet 3 inches high at its apex, and 18 feet 3 inches between abutments, while the passage underneath is 56 feet long. From Fifth Avenue, the arch is the gateway to the Great Lawn and there is always a lot of foot traffic, like the day of our walk so I wasn't able to take a good shot. Here's a photo from a previous walk, the alternating sandstone and greywacke look so pretty. The arch's underpass is one of my faves, look at that unique design! 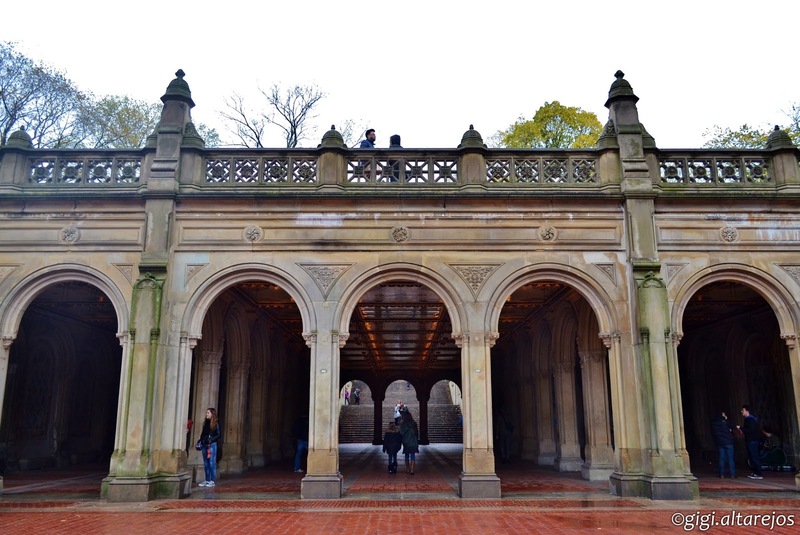 Just a few steps away from Greywacke Arch is The Obelisk, the oldest man-made object in Central Park, and the oldest outdoor monument in New York City. We stopped by briefly to take a rest from the heat when something in one of the trees caught my eye .. a robin's nest! Then we're off again walking north towards The Reservoir. Around The Reservoir are three of the park's remaining cast-iron bridges, but we were only able to go to the Southeast Reservoir Bridge. Reached easily from the Fifth Avenue and 85th Street entrance to the park, Southeast Reservoir Bridge is one of three cast-iron spans over the bridle path in the vicinity of the Reservoir.Much trafficked, it links the Reservoir footpath, a crossing at the drive, and paths coming from two popular park entrances.The 33-foot long span has a height clearance of 10 feet 3 inches, a moderate size for a cast-iron arch. The span was erected at one-fifth the cost of a stone span, one explanation for the popularity of cast iron in the last century. It was a grey and cloudy day, I think it made The Reservoir look prettier. Agree? From The Reservoir, we passed through the North Meadow until we reached Springbanks Arch, one of the gateways to The Ravine in the North Woods. 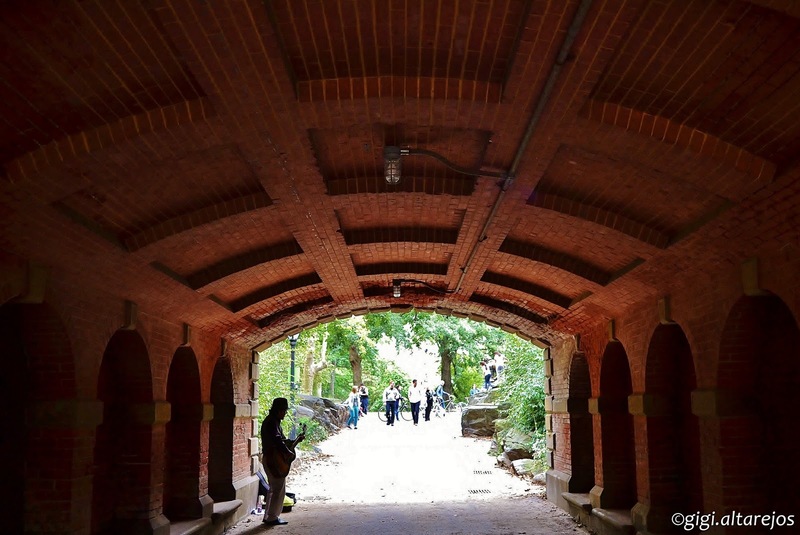 Springbanks Arch, with a striking resemblance to some of the archway facades at Regent's Park in London, is a shaped-stone and brick-masonry structure located at the north flank of the North Meadow on the latitude of 102nd Street. A short flight of uneven slab steps leads down to its underpass. Its semicircular arch is segmented with rough stone from the Hudson River Valley. Narrow, long, but with little headroom, the archway measures 17 feet 5 inches across, 9 feet 2 inches high and 71 feet long. Red brick lines the passage. A modified entablature follows the shape of the arch at the center and extends outward along the revetments that curve at right angles into the soil. The abutments are covered with soil and planting. A cast-iron railing on the south side is 50 feet 8 inches long. Just a little bit further from that end of the arch is one of the rustic bridges in the North Woods. I love it here, it's so peaceful, you'd never know you're in the middle of the city. 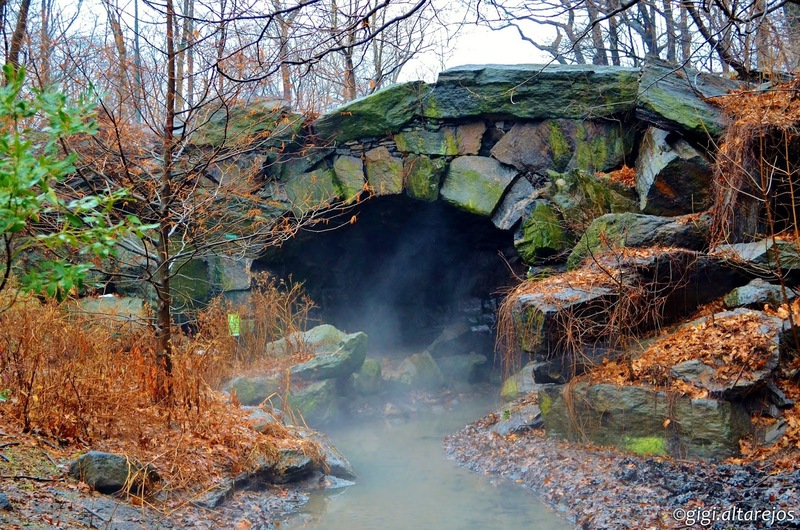 Across this rustic bridge is Glen Span Arch, the gateway between The Pool and The Ravine. The arch is built of large-sized, light-gray gneiss, roughly dressed and laid in ashlar. Boulders are piled randomly around the boulder abutments placed at the time of original construction. Ornamental detail includes a belt course at the spring line, some pentagonally shaped voussoirs and upright members on each side of the east-arch elevation.The span width is 16 feet with a height of 18 feet 6 inches. The underpassage is some 50 feet alongside the brook. The sidewalls on top are 65 feet long.Within the underpass are wide archways to either side. The one to the south by the path is shallow, the north one deep. Purely decorative, these grottos are vestigial remains of a popular device of the Picturesque style. Those ladies in colorful gowns are from And All Directions I Come to You presented by Lauri Stallings + Glo. It is part of Drifting in Daylight, a free exhibition at the north end of the park of eight site-specific artworks that promises to engage all of your senses. The exhibition ended on June 20, 2015. A lot of people were watching the performance so it was hard to take a good shot of the entire Glen Span Arch. Here's a shot from last winter, see how pretty the arch is in the snow. At the other end of The Loch is I think one of the park's best kept secrets, one of its waterfalls. Facing this waterfall is the third gateway to The Ravine, the Huddlestone Arch. Of all the archways in Central Park, Huddlestone is the most picturesque. To sit at Huddlestone's southern portal on a spring day in the Ravine is not to be in New York, but in a country setting where forsythia abounds and the sound of a gently flowing brook soothes the spirit.The bridge is striking for the immense size of its boulders. One lodged in the base is reputed to weigh close to one hundred tons. Vaux's instructions to the men building Huddlestone were to choose boulders lying around the park that were most reminiscent of untamed nature. Unlike many bridges further south in the park with precisely cut stone in ordered patterns or with delicate ironwork, the boulders of Huddlestone Bridge look as if they were brought together by some natural phenomenon that just happened to leave a 22-foot wide, 10-foot high arch. According to the park website, the arch was constructed without the use of mortar or other binding material, and only gravity and pressure keep the massive boulders in place. Wow! The above photo was taken from the north end of the arch looking south to the Ravine. Here's one taken on a misty and foggy winter day, this time from the south end of the arch. The north end of the Huddlestone led to the Harlem Meer. It looked so pretty the day of our walk. By this time we have walked the entire length of the park, from south to north. From the Meer, we turned westward which would lead us to the northernmost arch of the park, Mountcliff Arch. As the other two to the south, Claremont Arch and Eaglevale Bridge, it is built of gneiss in rockface ashlar. Material and handling are suitably rugged for this end of the park, which has its steepest slope along with a nearby cliff. It is a big bridge, being 102 feet long and 48 feet high, with a Tuscan arch some 16 feet high and 21 feet wide. A few blocks south of Mountcliff Arch was the last arch we visited that day, Claremont Arch. 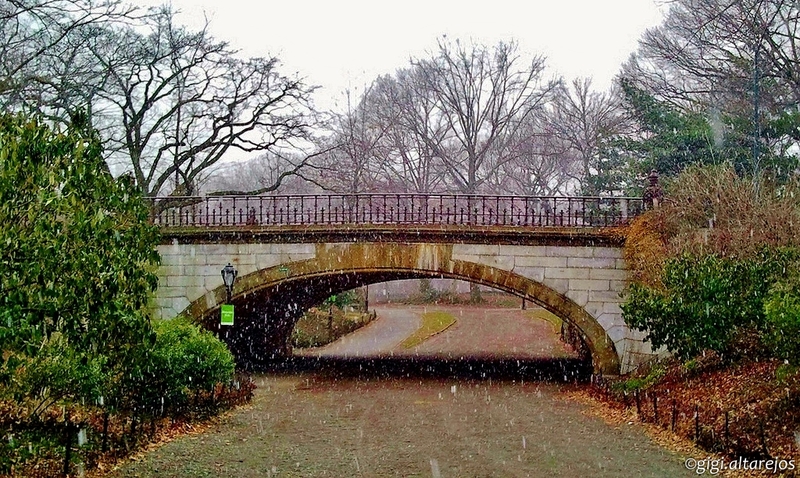 The bridge at Central Park West and 90th Street had no name. As it is over this bridge that the cavaliers enter the park, and as the Claremont Riding Academy at 175 West 89th Street is the only survivor of the many stables once found around the park, it seems appropriate to adopt the Academy's name, which was originally that of a country house that once stood north of Grant's Tomb. The bridge has an arch approximately 8 feet high, 9 feet 4 inches wide, and 58 feet long, the length explained by its being beneath the access road. The stone is Manhattan schist in rockface ashlar. The parapet walls, also of schist, are about forty feet long. The bridge has unusual elevations in that, horizontally, they take the shape of an elongated S.
Claremont Arch is the other arch that is closed-off to the public and is currently used as a storage area. When we first started to plan out our walk, Angel and I were thinking we'll try walking to half of the park's arches and bridges. Well, it was a very productive day! We were able to visit 27 arches and bridges in about eight hours of walking. We missed just three: Winterdale Arch, and the two other bridges around the Reservoir bridle path, the Southwest Reservoir Bridge, and my favorite, the Gothic Bridge. I'll share below photos of these bridges that I've taken during previous walks in the park. Winterdale Arch is along the West Drive by 82nd Street. Winterdale Arch was so named because it was part of what was known as the Winter Drive. On both sides in this stretch were planted evergreens for winter color. 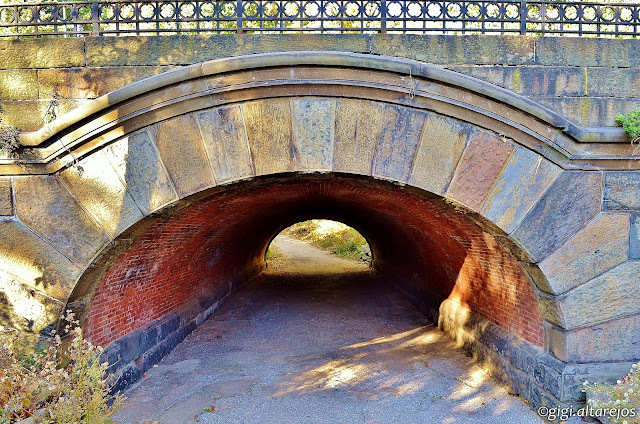 The imposing breadth of its arched opening is enough to host both the bridle path and a pedestrian path separated by an ordinary pipe rail fence running under the dark hollow. The wide, elliptical arch has a span of 45 feet 6 inches, the largest span of all the stone and brick bridges, and a height of only 12 feet 3 inches. The arch is faced with smooth Maine granite and set in regular ashlar sandstone moldings that follow its contours. Buttresses to either side of the arch curve down to low supporting walls with posts treated as stylized urns. The interior vault and walls are lined with Philadelphia pressed brick interspersed with Milwaukee white brick in a cross pattern. Winterdale in winter, that sure looks pretty! The Southwest Reservoir Bridge is just several meters north of Winterdale Arch. There are only few instances when the area below the bridge is void of vehicles as it is close to the Central Park Police Precinct and police vehicles are always parked by the bridge. Luckily, I have a shot of the bridge without any vehicles parked below so you all can see how intricate the details are. The stone abutments, substantially below ground, support the 38-foot, 2-inch-wide and 10-foot, 9-inch-high arch and a 72-foot span with openwork ornament. The floral scrolls of the cast-iron spandrels and railing reflect an innovative motif of interlacing leaves and curling forms. The posts have tops in the shape of modified urns. 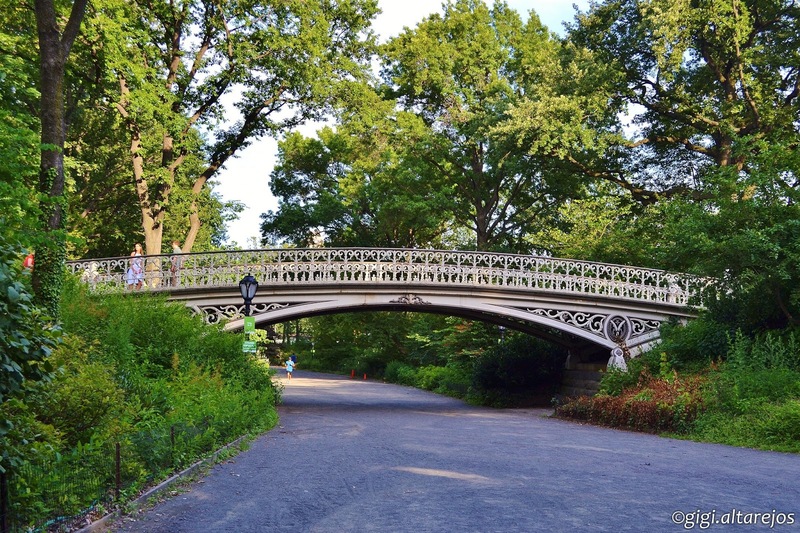 Completing Central Park's bridges and arches is the Gothic Bridge or Bridge No. 28, located at the middle northern end of the Reservoir. 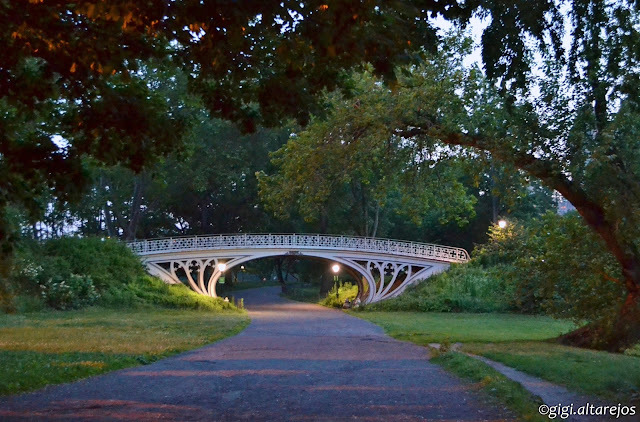 This famous cast-iron bridge, designed by Calvert Vaux and erected near the north gatehouse of the Reservoir by 94th Street, was long known simply by number. Yet, it seemed somehow deserving of a name and has lately received one, appropriately, "Gothic Bridge." The cast-iron spandrels are developed like Gothic windows modified into windblown curves conforming to the oval contours of the arch. Floral crockets adorn the inside of the curves. 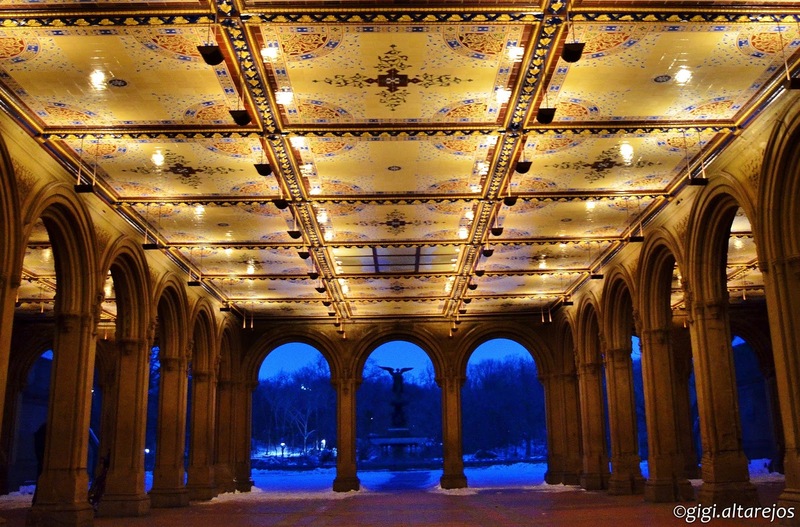 Graceful and distinctive, the archway is 37 feet 5 inches at its widest point and reaches a height of 15 feet 3 inches. Gothic Bridge is 11 feet 7 inches wide and has a 93-foot railing. It was manufactured by the J. B. & W. W. Cornell Ironworks. The abutments are of Manhattan schist from the park.The third of the cast-iron bridges around the Reservoir, like the other two, permits visitors to avoid crossing the bridle path. Equestrian traffic today hardly mandates the presence of the bridge, but it remains as a fanciful addition to the landscape, for the visitor's delight. It sure is one lovely bridge! I hope you enjoyed walking with us as we went from bridge to bridge, arch to arch. I'll end this post with this panoramic shot I took while we were walking along The Lake that day. 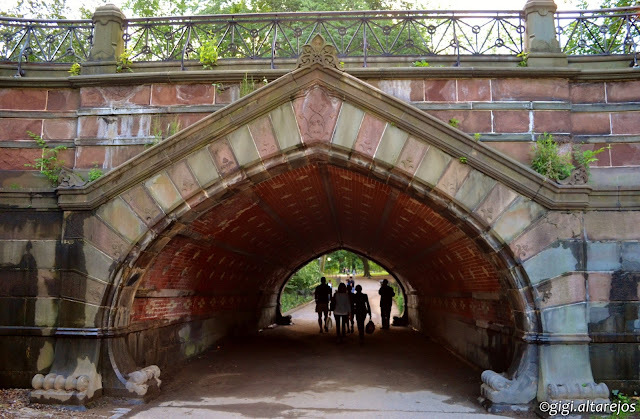 Central Park is one beautiful place, and its bridges and arches make it more charming and easy to make memories in. I consider myself lucky that I am able to enjoy the park and walk there as often as I want to. Hope you all could get the chance to see and walk across its bridges and arches!